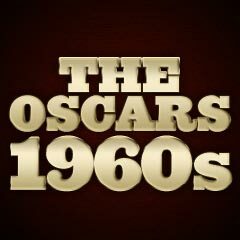 The Oscar ceremony in April 1968 was delayed by two days (and held on April 10) due to Martin Luther King's assassination on April 4th and subsequent funeral. This was the second time in Academy history that the ceremony was postponed (it was also delayed in 1938 and 1981). This year marked the first year that the cinematography categories were merged back together - after 28 years. No longer would there be a distinction between color and black-and-white films. This would also be true for the categories of Art Direction and Costume Design. 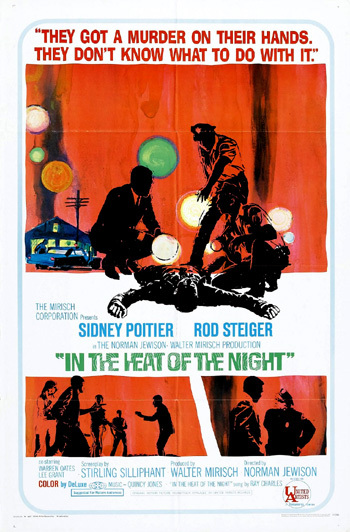 The ultimate (surprise) compromise winner in the Best Picture category was director Norman Jewison's engrossing thriller-murder mystery and sleeper comedy/drama film, In the Heat of the Night (with seven nominations and five wins - Best Picture, Best Actor, Best Screenplay, Best Film Editing, and Best Sound). It illustrated the racial tension, prejudice, and eventual mutual respect and camaraderie expressed between a black police detective from the North (Philadelphia) and a Southern racist, white police chief in the small Mississippi town of Sparta, where both were compelled to work together on the same homicide case. The film, with a non-white actor in a lead acting role, was so controversial that it couldn't be filmed in the Deep South, so the sets were recreated in various small towns in two states: Sparta, Freeburg, and Belleville, Illinois, and Dyersburg, Tennessee. Another Best Picture nominee that was considered controversial because of its racial theme (it was Hollywood's first mainstream film about inter-racial marriage!) was liberal director Stanley Kramer's socially-relevant problem-comedy of racial co-existence, Guess Who's Coming to Dinner (with ten nominations and only two wins - Best Actress and William Rose's Best Story/Screenplay). It was about a liberal couple (Katharine Hepburn and Spencer Tracy) who are values-challenged when their sole young daughter (Katharine Houghton) brings home her prospective marriage partner - a world-renowned black surgeon (a typecast role for Sidney Poitier, the biggest box-office star at the time). The critical and box-office failure, 20th Century Fox's and director Richard Fleischer's trifling Best Picture-nominated Doctor Doolittle (with nine nominations and two wins - Best Song "Talk to the Animals" and Best Special Visual Effects) with Rex Harrison in the un-nominated title role as the English, 19th century animal-loving veterinarian, was not considered a serious contender, although it was a big-budget effort. Of the five directors in the Best Picture nominees, only director Richard Fleischer of Doctor Doolittle was not nominated. Richard Brooks took Fleischer's place in the Best Director nominees for his directorship of Truman Capote's docu-drama "non-fiction novel" of a mass murder of a family in 1959 in Kansas, In Cold Blood (with four nominations and no wins). Mike Nichols' win for Best Director of The Graduate (the film's sole Oscar) was considered a consolation prize for his loss the previous year. Both Bonnie and Clyde and Guess Who's Coming to Dinner had at least one nominee in each of the four acting award categories. The winner in the hotly-contested Best Actor category was Rod Steiger (with his third and last career nomination and his first Oscar win) as gum-chewing, bigoted, Southern small-town local sheriff Bill Gillespie in In the Heat of the Night. By chance, he has to work on a local homicide case with the aid of Northern black detective Sidney Poitier's know-how. Katharine Hepburn hadn't won an Oscar since 1933 - 34 years earlier, although she had been in many fine roles since then. She finally won her second Oscar (and it wouldn't be her last) as liberal-thinking Christina Drayton whose daughter is considering inter-racial marriage with a distinguished black surgeon (Sidney Poitier) in Guess Who's Coming to Dinner. It was Hepburn's tenth career nomination, tying her with Bette Davis (also with two Oscars) as the most-nominated actress. Hepburn would go on to surpass Davis with two more Oscars and a total of twelve career nominations. The winner in the Best Supporting Actor category was George Kennedy (with his sole career nomination - and only Oscar) as battling and then admiring convict boss 'Dragline' who struggles against Paul Newman for leadership and eventually becomes his second-in-command friend and co-escapee in Cool Hand Luke. Co-stars Gene Hackman (with his first nomination) and Michael Pollard (with his sole career nomination) were both nominated for Best Supporting Actor for their roles in Bonnie and Clyde as Buck Barrow (Clyde's brother) and as baby-faced car mechanic and gang member C.W. Moss. The Best Supporting Actress award was captured by Estelle Parsons (with her first nomination and sole Oscar win) in her second film as neurotic, hysterical and annoying Blanche Barrow (outlaw Clyde's sister-in-law) in Bonnie And Clyde. Producer/director Alfred Hitchcock was presented with the Irving G. Thalberg Memorial Award, possibly in recognition of the fact that he had been nominated five times for Best Director and had lost every time: for Rebecca (1940), Lifeboat (1944), Spellbound (1945), Rear Window (1954), and Psycho (1960). This was Hitchcock's first and only 'Oscar'. It was definitely unusual that Best Picture competitor The Graduate won only the Best Director Oscar and nothing else - it should have at the least won Best Writing, Screenplay Based on Material from Another Medium for Buck Henry and Calder Willingham - and the Best Picture honor. Theadora Van Runkle's Costume Design nomination for Bonnie and Clyde was defeated by John Truscott for his costuming of the period piece Camelot. Writer/director Richard Brooks' black and white crime drama In Cold Blood, with a script by Truman Capote and a powerful un-nominated performance by Robert Blake as a murderer, received four nominations (Best Cinematography for Conrad Hall, Best Adapted Screenplay, Best Director, and Best Score - and no Best Picture nomination) without any success. Richard Harris was un-nominated as King Arthur in Camelot, as was Richard Burton (as Petruchio) opposite Elizabeth Taylor (as Katherine) in director Franco Zeffirelli's romantic comedy The Taming of the Shrew (with only two nominations: Best Art Direction and Best Costume Design). Best Song nominees included: "The Bare Necessities" from Disney's Jungle Book, "The Eyes of Love" from Banning, "The Look of Love" from Casino Royale, "Thoroughly Modern Millie" from Thoroughly Modern Millie, and the ultimate winner: "Talk to the Animals" from Doctor Doolittle. Two very popular songs were neglected in the selections: "To Sir With Love" from To Sir, With Love, and Simon and Garfunkel's "Mrs. Robinson" from The Graduate.